Facebook Safety Page – Bookmark It – Media! Tech! Parenting! According to a short article in School Library Journal and a Facebook blog post, the world’s largest social networking site now has a new safety page as well as an advisory committee of well-known online safety organizations. Both articles offer Facebook users a detailed guided tour of the new site where teens, parents, and educators can go for up-to-date information. Users can navigate to safety information in several ways. A Facebook safety page looks just like any Facebook page with useful links and a wall with a fairly lively conversation. This page will also post important documents, educational materials, and safety initiatives. A link at the top of the Facebook safety page leads to safety resources (see above right illustration), including a safety guide and frequently asked question and answers, organized by topic. 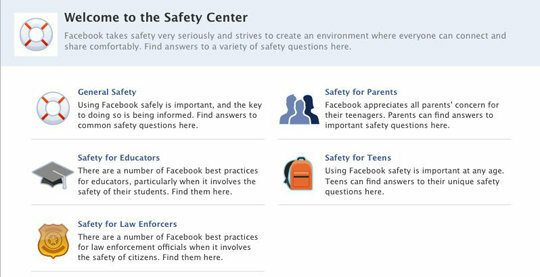 The Facebook Safety Center (illustration just to the left) organizes topics in a sightly different way with FAQs — for educators, teens, and parents.